The 2-Sigma problem refers to the phenomenon that students tutored one-on-one perform two standard deviations better than students learning via conventional classroom instruction on average. During one-on-one tutoring, the tutor can conform to the individual learning style and preferences of the student. Because the resources required to provide this tutoring to every student is unrealistic, we seek other methods of instruction that will have comparable effects to one-on-one human tutoring. Research involving robotic agents as tutors indicates that the physical presence of a robot can increase cognitive learning gains, enjoyment, and compliance. This motivates the need to investigate robotic tutoring systems as an effective method of instruction. One salient aspect of a tutoring interaction that human tutors are well suited for is providing help to the student at the right time. While there has been much research demonstrating that on-demand help is useful in interactive learning environments, students only benefit from this help when it is used productively. Two established patterns of behavior in interactive learning environments involve learners who are help-averse, and learners who game the system. 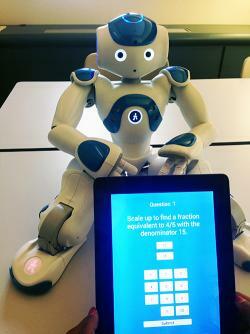 As social robots are novel learning companions, it is important to understand if these same types of help-seeking strategies seen with interactive learning environments transfer to interactions with social robot tutors. It would useful to design interactions that contain adaptive support strategies to combat these sub-optimal help-seeking behaviors. This can shape more productive help-seeking strategies used by children and will ultimately help them engage with the learning environment more effectively. We are currently investigating what types of help-seeking behaviors children engage in when interacting with a social robot tutor over multiple sessions. The sessions consist of fifth-graders interacting with a NAO robot while doing fractions problems. Throughout the interactions, the robot will provide help to each individual student upon request. We are also simultaneously trying to understand what types of intervention strategies the robot can employ to shape more productive help-seeking behaviors in children.